Seeing as this week is the beginning of all the world’s fashion weeks, it is only appropriate that I announce the launch of my newest series on The Style Scribe! This new series, Under The Influence, will feature personal interviews with fashion industry influencers that inspire and motivate me. These influencers run the gamut of designers, editors, stylists and more. I’m so thrilled and proud to share my first interview with one of my favorite designers of late, Jenni Kayne. Her pieces are fresh and colorful, with clean lines and comfortable silhouettes that make for very wearable (but incredibly chic) wardrobe staples. Her D’Orsay flats have become such a hit – I own and love the mint suede pair. This post is also perfect timing, seeing as I’ll be attending her Fall 2013 presentation on Friday. I can’t wait to see the collection! I hope you enjoy the first edition of Under The Influence – any feedback is much appreciated, so be sure to comment! Merritt: You have lived out every young girl’s dream. At just 19, you designed and launched your first line for Jenni Kayne. That kind of ambition doesn’t appear in every teen, so where do you think it came from/who do you take after? Jenni: My parents always encouraged me to go after what I wanted and they’re my inspiration. Merritt: I love that you named your blog (Rip + Tan) after your kids. In what other ways do they influence your designs? Jenni: Thank you! Having two kids has influenced the way that I dress – I like to be comfortable but also like to still be chic. Finding that balance has inspired pieces in my collection. Merritt: I’m totally on board with your mantra of designing only “super-chic, easy to wear clothes” – which style icons past and present do you think epitomize this idea best? Jenni: Kate Moss, always and forever. Merritt: What’s it like to base your fashion house in California as opposed to NYC? Any challenges or benefits that come to mind? Jenni: It’s a little slower paced here, which I like. I think it just goes along with our lifestyle in California. I love going to New York for Fashion Week and it’s a great change of pace and also inspiring. I don’t think one is better than the other – they’re just completely different! Merritt: You designed your first line back in 2003 – what moments/events stick out to you as the biggest “aha” or “I’ve really made it” moments? Jenni: My first show in New York for fashion week was huge for me. Also creating the D’Orsay Flat and seeing them succeed and so loved is also great. Merritt: What are your favorite style staples (outside of your own line, of course)? What would we catch you wearing on a day-to-day basis? Jenni: Acne jeans, D’Orsay flats, a Patricia Underwood hat, a Manin ring, and a great sweater. Merritt: What’s on the books for 2013? I think the real question is, where/when can people find Jenni Kayne pieces in Texas? Jenni: I’d really like to open some more boutiques – it’s all starting to come together. I’m selling my D’Orsay Flats at Tenoversix in Dallas now and would love to find a store in Austin to carry the collection – I’ve never been and am planning on going this year! 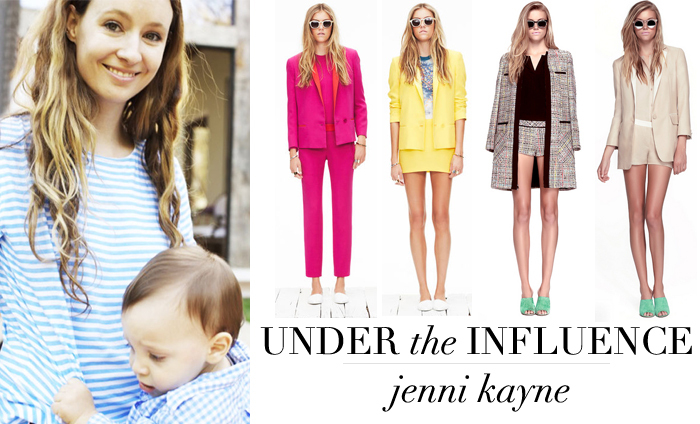 A special thank you to Jenni Kayne for the interview – be sure to shop her gorgeous pieces here! I thoroughly enjoyed this interview. I had seen some great things by her on Piperlime, and it is always nice to have a face and story behind the looks. thank you so much! I’m so glad you liked it – hoping to share some other exciting interviews very soon! thanks Jena! Really appreciate the feedback! I think I’m going to love this new series! It’s something different, and my favorite parts of magazines are always the designer interviews and glimpses into their lives. Congratulations on this! !